I won the R2D2, but we're in the middle of moving into a new house so I won't be able to post a picture anytime soon!! It came in the mail this past week though!! "Box was great conditions when I was sent it. Even doubleed brown wrap papers for special you. If still problem, can you file claim with USPS Post office local. Thanks." Only top notch UPS for me...To US and Canada anyway. Finally, received my box. Thank you so much. Here are a couple of pics of my prize. Thank you for the generous prizes! I'm glad they got there safe. Just here to say I enjoyed the raffle and was glad to support what I could. I would be happy to support again next year if you need to do it again and I hope you reached your goal and helped the school. Good job on this event. Isn't this what LEGO is all about, in the end? Did you eventually get the bat pod or lost your chance due to not replying on time? I didnt reply in time... I was like 2 days away. Did we ever hear about the surprise bundle set(s)? Fantastic...Better than sitting in a box on a shelf! 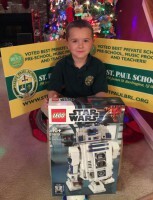 The Second Annual Brickpicker Raffle for St.Paul School Coming Soon! I would be more into this if I had done better last year. Just kidding. The kids are who won in the end. This year I will send my donation sets in prepackaged mailing boxes to make it easier on you. I have dibs on donating a 10188. It will look bad to have too many in one raffle.